Fake antivirus pop-ups hacking into computers ! MISSOULA - Univision Computers, a company based in Missoula, is warning people about a fake antivirus alert pop-ups that could not only damage your computer, but could pull personal information from it. The FBI says it's called "scareware" because criminals try to frighten you into buying fake antivirus software with a seemingly genuine security warning. And here's how it works: a pop-up message comes up saying you have a virus. And to fix the problem, all you have to do is install the software. "Frequently they'll ask you for a credit card for payment and promise that they will fix whatever's wrong with your computer. Clients who do that discover that they have a charge on their credit card, their credit card information is out there for the crook who invented the scareware and their computer is often even further infected and sometimes completely disabled," says Penny Lyons, Univision Computers Customer Service Representative. Using this virus, the cybercriminals can also pull personal information and passwords you may have stored on your computer. The creators of this fake antivirus collect millions of dollars each year by using this technique. And some of these viruses could be triggered pretty much anywhere on the internet, because legitimate websites may not know right away that they have a virus. "Clicking on links that you're not familiar with, sometimes looking for free things that you shouldn't be getting for free. Once in a while you'll hit an infection on a site that's completely legitimate that this infection has been placed on for a short period of time," Lyons said. So how do you avoid it? Well, the only sure way is not to use the internet, but there are precautions you can take to make yourself less vulnerable, which includes having good antivirus. software. "If you install Norton, Norton will have a specific pop-up window that it will pop-up when it detects a virus, so just get familiar with what that looks like and if you get a pop-up that isn't or doesn't look like the one that you're used to, it's probably scareware," says Alex Fleig, Univision Computers Vice President. Another way you can protect yourself is to keep systems such as Windows and Adobe updated with the latest version. 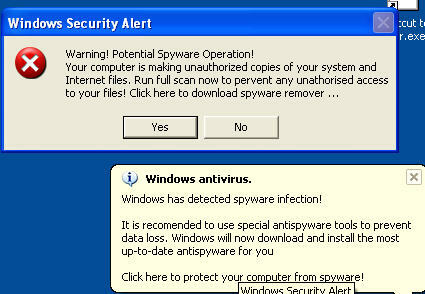 "Whatever antivirus program that you do choose, be familiar with what the pop-ups look like. So for example, Adobe Flash has a very bad security hole in it. So what Adobe did is that it fixed the problem and they released that in an update to the Flash program. So by installing the update to Flash, what you're in essence doing is that you're closing that security hole that allowed the virus to actually install itself on you machine," Fleig said. Computer experts also say if you think you're being infected at the moment that you're on a website, turn your computer completely off, to prevent the virus from installing.